Ever have a plant that just won't grow for you? Or even a whole group of plants? For me, it was greens. It didn't really matter what type - if it went in a salad, it probably wouldn't grow for me. Seeds wouldn't germinate. It would be too hot or too cold. Slugs ate the lettuce. Grubs ate the spinach. Whatever the reason, I never ended up with enough greens for a even a garnish, much less an actual salad. This year, however, I was determined that things were going to be different. It was going to be THE YEAR. I sowed early greens in well-prepared raised beds and under the protection of a row tunnel. I soaked and germinated my stubborn spinach seeds between damp paper towels in a baggie and then planted them in seedling trays indoors. Lettuce seeds were also started indoors before careful transplanting into the veggie bed. Did it work? Did all my efforts pay off? To my delight, this year all of my salad greens grew - almost too well! I can probably now invite the entire neighborhood over for salad and garnish some pasta plates while I'm at it. 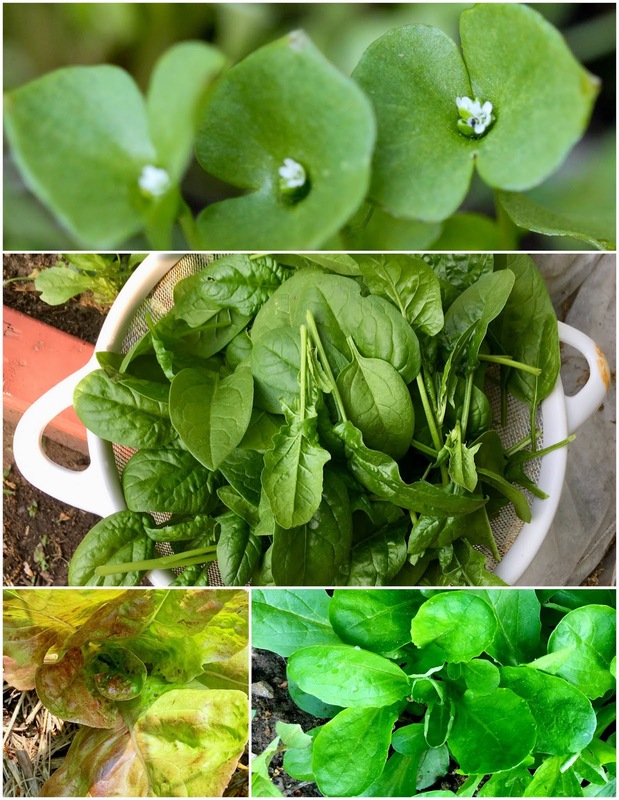 I grew four different types of greens this spring, and they all did well. My favorite was Claytonia, also called miner's lettuce after being used by California Gold Rush miners to prevent scurvy. Native to western North America, it has mild-tasting, succulent type leaves and eventually little white edible flowers. It was both the easiest green to grow and the most productive. I couldn't eat it all and started giving bags of it away! The 'Four Seasons' Lettuce was delicious, productive, and the prettiest of them all, with its beautiful red-tinged leaves. 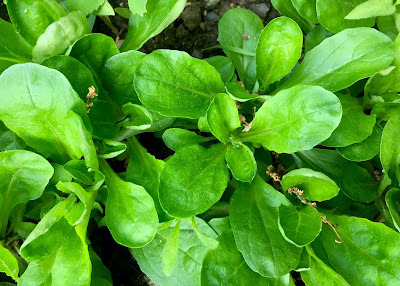 Corn Salad, aka Mâche, did well and was the earliest of the greens to grow. Last on the list was spinach. 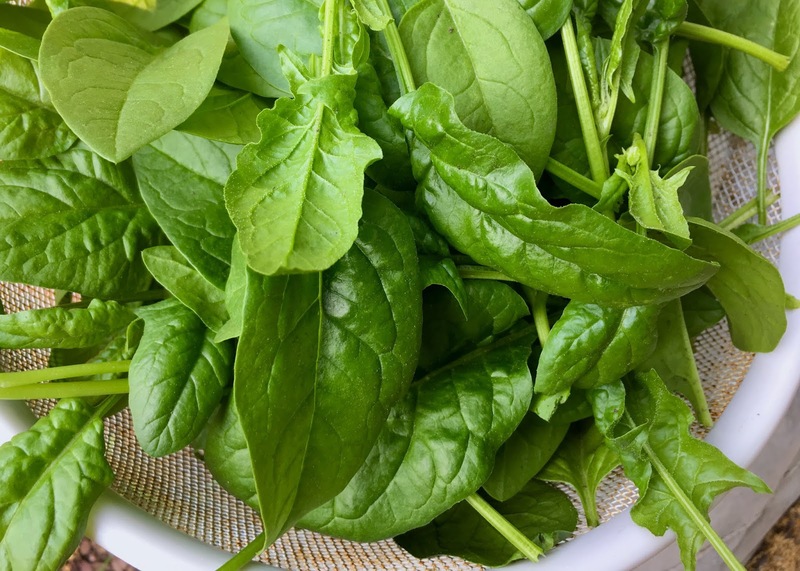 I love spinach, but it was most notable for both taking the most work to grow and for bolting the earliest in the warm weather. I did still get quite enough for a salad or two, though. Yay! That is very exciting! I've had some of these issues, too. Finally finding a system that works, like you are, and I'm still learning. 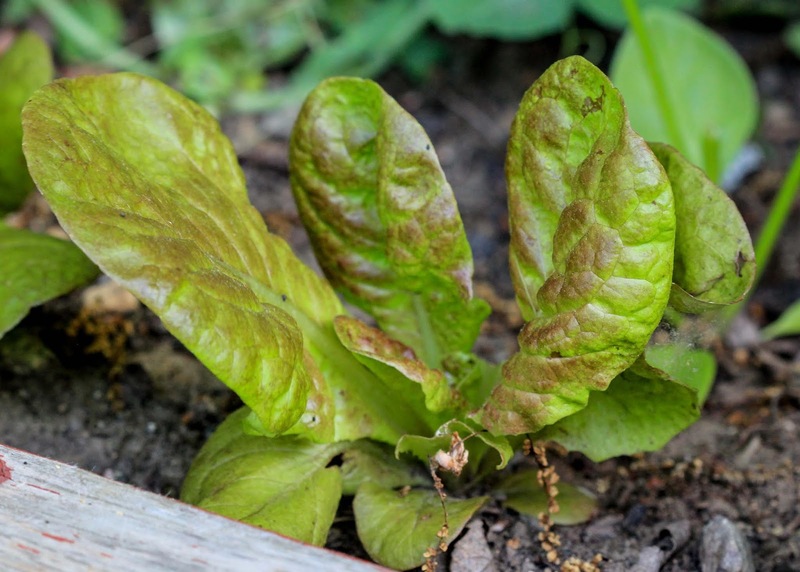 Growing lettuce in dappled and partial shade is a little trickier. :) Congrats! Your greens look yummy! Yeah, my bed in the back of my veggie garden gets more shade, and anything is trickier to grow there! Good luck! Congrats! Nothing like fresh greens - yours look very tasty! Thank you! I am enjoying them. I know just what you mean! I usually skip the greens since they do poorly. This year I grew spinach, chard and lettuce. The spinach and lettuce did well in a small bed (bottom of an animal cage with holes poked, and potting soil! ), but the chard didn't do much. The Guinea pigs loved it though. Miner's lettuce was a volunteer for the first time, I have never planted it. I let it go to seed. It was delicious. I don't usually bother with cool season crops, and probably won't again. Lettuce maybe, I still have leftover seeds. I planted some seeds for chard, but they are coming up very slowly. We'll see how they do. Very nice to have Miner's Lettuce volunteer itself! Awesome that you find the way to successfully grow greens! I often feel like such a failure when I can't get my plants to grow from seed. They don't always tell you on the seed packages which plants need cold/wet stratification. It would be very helpful if they included that information. I agree, half of it is knowing the tricks for each type of seed! Spinach was very tricky for me. I sprouted them indoors since half the time they wouldn't even come up at all for me outdoors. Thankfully I think it is mostly perennials that need the stratification. Have you ever bought seeds from Prairie Moon Nursery? They are really great at saying what each type of seed that they sell needs. In my experience once you have Claytonia you will never have to sow it again. It self-seeds all over the place. Ha, good thing it is one of my favorites, then! Looks delicious! In our garden salad greens always get eaten up by the bunnies. We call my veggie garden the 'veggie prison' sometimes because we had to fortify it against so many different critters! Chicken wire is even buried a foot down into the ground because of the groundhogs. If I didn't have a fence there would definitely be no greens! Thank you! I was determined this time, ha! I did have a nice weekend with my family. I hope you did as well! Hm. Maybe I need to try Claytonia? 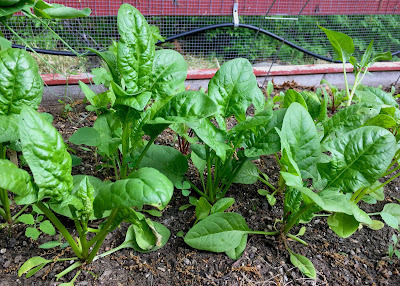 In the past, I've had decent luck with lettuce (it even self-sowed a couple of years) and mustard greens (which are still volunteering here and there oh about 5 or 6 years after I first sowed them). Nothing like fresh grown and harvested salad. You have my sincere admiration!! PS - Any tips on transplanting seedlings to garden beds. Usually my seedlings fall apart when I've tried it in the past and it ends in disaster. After my veggies did so poorly in the ground, I went to raised beds. So much easier to grow. I have a good amount of clay still here, though I'm sure not as much as you do! I'm not sure if I can help you with the seedlings, as my spinach seedlings fell apart too. I ended up having to tip the whole tray over and fish each little seedling out. I made a small hole in the garden bed for each one, put it in, and then firmed up the soil around it. It was rather labor intensive, but they turned out fine at least. Let me know if you come up with anything that helps! Congratulations on your salad success! Your greens all look delicious! Fabulous success and I may have to start mine indoors too as it is a crap shoot if I get greens due to weather...this year it was too hot in May and they didn't like it. I've struggled with weather in the past, too. I was surprised that my greens didn't bolt earlier this year. Heat affects them so easily. Isn't it fun to finally succeed at something that has been just beyond your grasp? Thanks for introducing me to Claytonia. I had never heard of it. I wonder if you could find slow-to-bolt spinach seeds? I'm sure you could find seeds for a newer variety that wouldn't bolt as quickly, as mine were 'Bloomsdale', which has been around for a while. 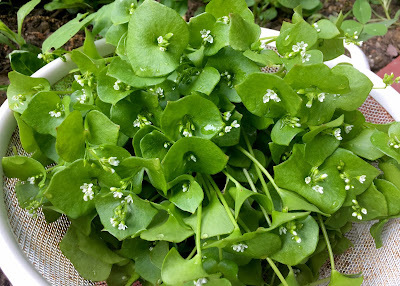 Claytonia was just as delicious and easier to grow, though, so I might just stick with that one! Success! What a lovely lot of delicious greens. Congratulations on such a resounding success. Over the years there are many plants which I have struggled with. At the moment the borders in the back garden have been flattened by a serious gale. Tomorrow I will carry out some restoration.